While you might expect your favourite celebrities to show up to a big red carpet event with a shimmery smokey eye or bold red lip, Kendall Jenner bucked tradition for Sunday night’s People’s Choice Awards by wearing a negative space makeup look that was very artistic and much more editorial than we’ve seen on the star before. 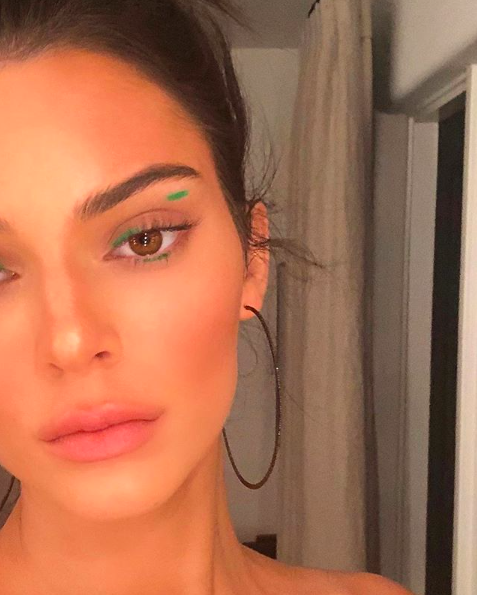 While keeping the rest of her eye makeup extremely minimal, makeup artist Mary Phillips used the Danessa Myricks Beauty Cushion Colour in Kandy Apple to paint seemingly random green lines below Jenner’s waterline, upper lash line, and eyelid. Another line of the bold hue was added to her collarbone. As for the rest of Jenner’s makeup, Phillips used the La Mer Soft Fluid Long Wear Foundation on the model’s face and the Nudestix Gel Colour in Posh on her lips. Although negative space makeup has been dominating red carpets for the past few years, Kendall’s take on the trend is especially easy to recreate. All you have to do is take a coloured liner and mimic the spacing of the lines on your waterline, inner corner, and upper lid.